If you walk into your local nursery we doubt that you will find a Gentiana plant for sale. We think they are wonderful plants that will grow well in Australia, Gentiana acaulis, pictured right being a favorite. The tall yellow flowering Gentiana lutea which is aptly named the ‘Great Yellow Gentian’ is also sought after. One of the easiest to grow of the acaulis group is Gentiana angustifolia, this is a stemless gentian with blue trumpet like flowers. It is more tolerant of soil conditions that others and usually free flowering. With smaller narrow trumpet like flowers, G. asclepiadea is commonly called the Willow Gentian. Gentiana are a group of alpine plants from Asia and Europe although some species are found in other areas. Gentiana are great for rock gardens, they do prefer shade but are not widely found in nurseries in Australia. 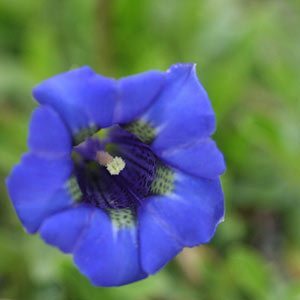 Varieties differ in growing habit and flower colour with popular species including the blue gentian, the low growing G. acaulis is relatively easy to grow although sometimes hard to bring to flower. G. scabra is more upright and easier to flower however probably not as dramatic. With over 300 species of the variety available is huge. Some gentians are low growing some are tall. G. lutea The ‘Great Yellow Gentian’ and is a species that will reach around 1m in height. Very easy to grow, in fact one of the easiest of all. Tall spires of brilliant yellow flowers in spring. G. macrophylla A large leafed species from China, the roots are used as a herbal remedy where it is known as Qin Jiao. Blue flowers and reaching around .7m in height. G.ternifolia is a native to China well worth seeking out, however it is the blue flowering species such as G. scabra and G. acualis are much in demand for garden use. G.tibetica – This is a species widely used in Tibetan, Chinese and Ayurvedic medicine. Gentiana plants are available from specialist nursery suppliers online.